The Community Garden articles generally discuss growing vegetables, but did you know that the flower beds surrounding the vegetables contain a very intentional mix of plants? We wanted a nice screen for the vegetable beds, but we also wanted to incorporate fruit trees and native plants into the edges of the garden. We have pomegranate trees, persimmons, kumquats, and figs to name a few of our fruit trees. And we planted food and nectar plants for butterflies and insects. 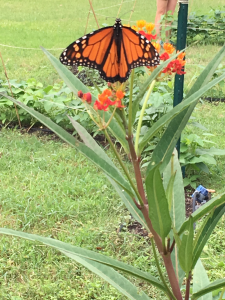 Our milkweed is quite popular with the monarch butterflies! The Upper Texas Coast has around 340 species of birds that either live in or migrate through the area and more than a dozen species of butterflies. Providing habitat and food for them helps them in their migrations. In addition to birds and butterflies, the native species also attract pollinators and beneficial insects that allow our vegetables to prosper without the need for insecticides or chemical fertilizers. Attracting birds, bee s, and butterflies to your own yards is not complicated. The Katy Prairie Conservancy (katyprairie.org) website has helpful information for getting started and has published a list of nine native species they encourage you to plant in your gardens. Houston Audubon (birdfriendlyhouston.org) has a page with a pre-planned garden for birds, bees, and butterflies that also includes a list of recommended plants. Both organizations have a list of sources for these native plants. Katy Prairie Conservancy advocates the planting of “pocket prairies” in sunny locations to help ameliorate the loss of our native prairies to development. MD Anderson and Rice University both have pocket prairies as do the University of Houston (Shasta’s Prairie) and University of South Texas (Father Meyer’s Prairie) I would encourage you to walk by the Spears home at 4108 University Blvd. They have made a pocket prairie from the lot adjoining their home. I went by last summer, and a stunning amount of butterflies and dragonflies were enjoying the habitat. These are all large installations, but a pocket prairie can be any size. A small bed in a sunny location will work, too. The Katy Prairie Conservancy site has helpful guidelines for making pocket prairies look like an intentional part of your landscape rather than like a wildscape. Native plant beds can also foster an interest in science and biology for your children or your own hidden inner scientist. Count and identify the number of insects and butterflies in the area before you plant the natives. Then document how many appear after the plants are established and blooming. iNaturalist.org will help you log and identify plants, birds, and insects:. If you don’t know the name of what you have seen, submit a photo and users of the site will help you. It also has an interactive map which shows what has been identified around you.